Thank God it’s Friday! 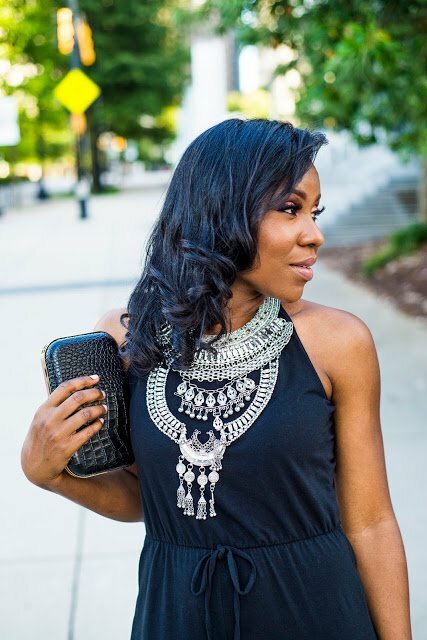 If you have been following the blog this week you would know I have been sharing different outfits I accessorized with Henri Bendel pieces from bags to jewelry. Today I am sharing the final look which is a night time look. This is what I would wear when going out with my girlfriends, on date night or a party. It is perfect for this time of the year and I love how the Centre Street Embellished clutch and Marquis Micro Snake embossed Mini satchel compliment this outfit. If you live in Atlanta, Georgia please join me on Sunday May 14, 2017 at Henri Bendel, Lenox Mall from 2pm-6pm, as I host a special shopping event in celebration of Mother’s Day. There will be 25% off just for that day on new arrivals, treats and drinks and I will also be raffling off a handbag. When in doubt when you have a special event to attend, stick to a statement top like I did, it is on trend and that way you don’t have to fuss about everything else. Mine is by Stylekeepers, they are known for their unique tops. I decided to keep things Summer fresh by wearing white fitted jeans, mine are by Topshop. I love the raw hem trend, it is perfect for a mom who wants to wear trendy jeans but would rather not embrace the ripped jeans trend. My black sandals are by Schutz, they are a classic pair and I have linked a lower priced option in the widget I created above. I love everything the Centre street embellished clutch. It is the perfect statement clutch. The hand stitched details is so gorgeous and I love that you have the option to wear it with or without the strap. The Marquis mini snake embossed satchel is perfect for night time too. I love the cuffed earrings and Tribal girlfriend bracelet and the Bendel Rocks Tribal ring. My favorite thing about Hendi Bendel is the variety of products they carry. Don’t miss out on the sale they have going on now. Thank you so much for reading, have a great weekend! Lovely look! The top is really pretty.